The kidneys are a pair of vital organs that perform many functions to keep the blood clean and chemically balanced. 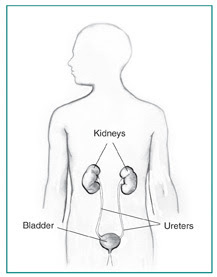 Understanding how the kidneys work can help a person keep them healthy. What do the kidneys do ? What is renal function ? The word “renal” refers to the kidneys. The terms “renal function” and “kidney function” mean the same thing. 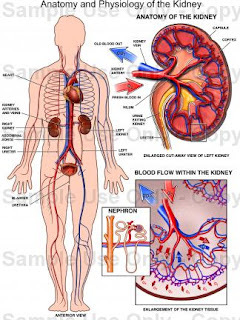 Health professionals use the term “renal function” to talk about how efficiently the kidneys filter blood. 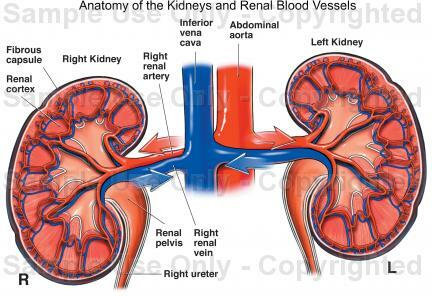 People with two healthy kidneys have 100 percent of their kidney function. Small or mild declines in kidney function—as much as 30 to 40 percent—would rarely be noticeable. Kidney function is now calculated using a blood sample and a formula to find the estimated glomerular filtration rate (eGFR). The eGFR corresponds to the percent of kidney function available. 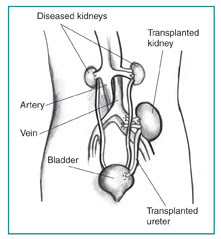 For many people with reduced kidney function, a kidney disease is also present and will get worse. Serious health problems occur when people have less than 25 percent of their kidney function. 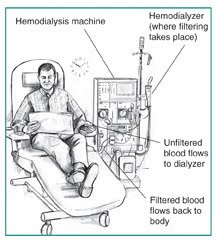 When kidney function drops below 10 to 15 percent, a person needs some form of renal replacement therapy—either blood-cleansing treatments called dialysis or a kidney transplant—to sustain life. Why do kidneys fail ? How do kidneys fail ? What are the signs of chronic kidney disease (CKD) ? What medical tests detect kidney disease ? Methods of kidney imaging—taking pictures of the kidneys—include ultrasound, computerized tomography (CT) scan, and magnetic resonance imaging (MRI). These tools are most helpful in finding unusual growths or blockages to the flow of urine. A doctor may want to examine a tiny piece of kidney tissue with a microscope. To obtain this tissue sample, the doctor will perform a kidney biopsy—a hospital procedure in which the doctor inserts a needle through the patient’s skin into the back of the kidney. The needle retrieves a strand of tissue less than an inch long. For the procedure, the patient lies facedown on a table and receives a local anesthetic to numb the skin. The sample tissue will help the doctor identify problems at the cellular level. What are the stages of CKD ? At this stage of CKD, hormones and minerals can be thrown out of balance, leading to anemia and weak bones. A health care provider can help prevent or treat these complications with medicines and advice about food choices. 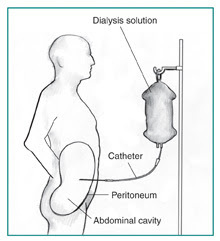 What can be done about CKD ? People who have diabetes should watch their blood glucose levels closely to keep them under control. They should ask their health care provider about the latest in treatment. People with reduced renal function should avoid pain pills that may make their kidney disease worse. They should check with their health care provider before taking any medicine. Protein is important to the body. It helps the body repair muscles and fight disease. Protein comes mostly from meat but can also be found in eggs, milk, nuts, beans, and other foods. Healthy kidneys take wastes out of the blood but leave in the protein. 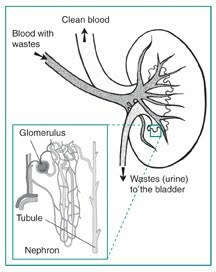 Impaired kidneys may fail to separate the protein from the wastes. Another problem that may be associated with kidney failure is high cholesterol. High levels of cholesterol in the blood may result from a high-fat diet. Sodium is a chemical found in salt and other foods. Sodium in the diet may raise a person’s blood pressure, so people with CKD should limit foods that contain high levels of sodium. High-sodium foods include canned or processed foods like frozen dinners and hot dogs. Potassium is a mineral found naturally in many fruits and vegetables, such as oranges, potatoes, bananas, dried fruits, dried beans and peas, and nuts. Healthy kidneys measure potassium in the blood and remove excess amounts. Diseased kidneys may fail to remove excess potassium. With very poor kidney function, high potassium levels can affect the heart rhythm. What happens if the kidneys fail completely ? In the area of transplantation, new drugs to help the body accept foreign tissue increase the likelihood that a transplanted kidney will survive and function properly. Scientists at the NIDDK are also developing new techniques to induce a person’s tolerance for foreign tissue before receiving a transplanted organ. This technique will eliminate or reduce the need for immunosuppressive drugs and thereby reduce expense and complications. In the future, scientists may develop an artificial kidney for implantation.